The New York Times broke the story in late 2012. There are zombie bees. So, Night of the Living Dead might be a true story!? Yeah, but with bees instead of people and . . . substantial script revisions. If zombie bees were going to “appear” somewhere, California does seem like the most appropriate place. Then, the zom-bees spread to Oregon. Then, Washington State. And, then . . . The zom-bees suddenly arrived in a fourth state, North Dakota. North Dakota? It just didn’t seem right. The zombie horror genre just hadn’t conditioned me to think of North Dakota as a sort of hot spot for zombie anything. Still, the bees can go where they will. If, as zombies, they still have a will of their own. Anyway, the short answer is: Zom-bees are with us. When you start to talk about zombies, the first question is, “What kind of zombies?” It’s not so much that there are different varieties of zombies as there are different versions. There are horror movie zombies, the zombies of folklore, and the “real” zombies – or, at least, “real” in the sense that a lot of people alive today absolutely believe in the reality of zombies. On the top of the heap, in terms of popularity, is the Hollywood horror version of the brain-eating zombie. However, many of the characteristics of these, oh, so familiar, zombies were made up by Hollywood writers. Digging deeper, we reach the cultural folklore of zombies together with anthropological explanations of that folklore. Many believe that what are taken to be zombies are persons who are drugged with a special concoction that, either by its very nature, or through precision dosing, so depresses vital functions that the victim is mistaken for dead and buried. The perpetrator, then, digs up the depressed, but still living, body of the victim and either fools or drugs them into a life of servitude. But what about our bee zombies? Well, actually, their zombification resembles none of the above. However, what happens to these bees is so zombie-like that, maybe, there no better or readily understandable term to describe what’s happening to the poor victims. Unlike the zombie of Hollywood, folklore, or Voodoo, the zombie bee falls victim to a parasitic fly, Apocephalus borealis. The fly lays its eggs physically inside the bee’s body. The eggs, in turn, affect the bee’s behavior. The process is not too unlike what was presented in the 1982 film, StarTrek: The Wrath of Khan, in which “indigenous eels” of Ceti Alpha V are introduced into the brains of the crew members, characters Chekov and Terrell, by the character Khan — maddened by his years in exile. The film’s eels enter the ears of their victims and, reaching their brains, render them susceptible to mind control. However, unlike Star Trek’s eels, the eggs and larvae of the Apocephalus borealis fly actually control the bee’s “mind” only briefly before causing its death. Then, they consume the bee’s physical remains. From another angle, the action of larvae in “eating their way out” of the dead bee’s body reminds one of another Hollywood creation, the mythical earwig. The earwig is a real and mean-looking insect, but it doesn’t enter the human ear, burrow into the human brain and lay its eggs. All of that was an old and almost forgotten “urban legend,” until it was featured in the March 1, 1972 episode of Rod Serling’s Night Gallery(Season 2, Episode 60, “The Caterpillar”). However, even this apocryphal version of the earwig had no ability to control the mind of its host. So, zombification was not part of the earwig repertoire. But a New York Times article that announced the arrival of the zombie bees, asked,“Whose in charge in [the bee’s] head”? Why? Because the fly larvae, inside the bee’s body, directly affect that honeybee’s behavior in disturbingly zombie-like ways. Under the influence of the developing fly larvae, the honey bee abandons its exclusively daytime routine and does something bees don’t do — flies at night. Just before, and during, this “last flight” into the night, the bee begins to move erratically. It ends its flight in death. Only then, do the fly larvae eat their way out of the dead bee to continue their growth to maturity. Hollywood has never quite dealt with this exact kind of zombification. 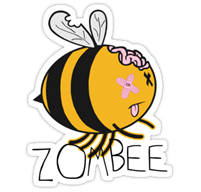 Of course, the zombie bee might be a good subject for a (not so) new and (not so) different kind of zombie movie. Maybe the zombie-making flies enter a hive belonging to beekeeper, Ms. Red Queen, owner of Raccoon Apiary. Realizing the problem, she uses an insecticide to kill all of the possibility infected bees in that particular hive. However, these flies are “mutants” and have laid mutant eggs in the bodies that hive’s bees. Instead of just eating the infected bees, these mutant fly larvae reanimate the dead bees into murderous zombie bees worthy of any respectable (or not so respectable) Hollywood production.